Wav-Legion is a full album fusion collaboration project by myself Shavon Bonnie Legion and Producer/Musician/Singer-Songwriter @wav-dr . The 13 track album dabbles in a wide variety of sounds. Myself and Wav-Dr connected through Blockchain music site Choon and have promoted the release heavily within social media and Blockchain sites like Choon, Musicoin and Steemit, utilizing both Dtube and Dsound on the Steemit Platform. The album has been well received so far after a global press release and some fantastic reviews from musical journalist with StepKid, Sparlking Sound and Mike O'Cull w/ Indie Music Guru. 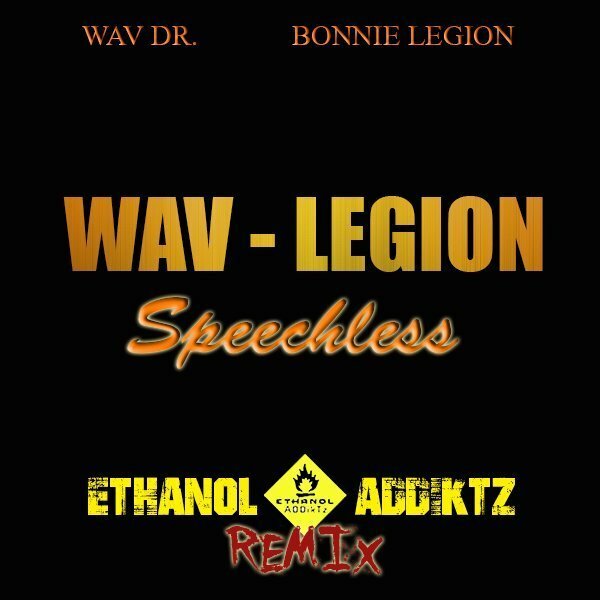 The latest remix to drop for the Wav-Legion full album fusion project is for our original track "SpeechLess" and comes to us from @ethanoladdiktz Ethanol ADDiKtz. Ethanol ADDiKtz is a production house founded by Mike Thompson aka (Minus13 - Dead Bones Crook). This is a very huge honor for me guys to have Mike AKA Minus 13 come in with Ethanol ADDiKtz for this remix. We have a long history together in making music and his talent absolutely brims with quality and uniqueness. There is a Minus 13 stain all over this piece from his incredible intros to his wide use of Electronic sounds. This is a Glitch Hop Experimental Electronic extravaganza of a track. It goes even further as we are treated to a small verse from Minus 13 which is a fantastic smile on my face. I absolutely love it. What a ride. Get your ears on this link above and let us know what you think. Check out more music from Ethanol ADDiKtz here! Thank you guys very much for listening. The response for this collaborative project has been tremendous. The remixes a sheer honor for both myself and @wav-Dr . We are already deep in a follow up album and a handful of other collaborative projects as the Wav-Legion duo. So much more coming guys its incredible. Stay tuned as we ride this musical sound Wave together. Love it ! Thanks the kind words , such an honor to work on this.